San Francisco airport became choked with dozens of carbon-spewing private jets last week as the rich and powerful flew into California for their farcical San Francisco Global Climate Action Summit. Once again we see liberals wallowing in their “do as I say, not as I do” way of living as they expect us to live like we are still in the Stone Age while they eat caviar and fly around the world in “climate destroying” private jets. But, even as these hundreds of arrogant liberals cavorted in the Golden Gate City to tell us to believe their unproven climate hypothesis. their actions were hypocritical to their attempts to shove down our throats a reduced use of fossil fuels to “save the planet.” The truth is if they really wanted to “save the planet” they would close their mouths and stop spewing the greenhouse gasses. Even the San Francisco Chronicle made fun of their private jet usage. One of the hottest spots during the just-concluded Global Climate Action Summit was the private runway at San Francisco International Airport, where SFO spokesman Doug Yakel reports corporate jet traffic was up 30 percent over normal. Airport sources told us that the carbon-spewing corporate jets nearly filled the landing area’s parking slots and that many had flown in for the conference. The three-day climate confab drew more than 4,000 elected officials, business executives, and environmentalists from around the globe and was aimed at addressing how to lower the carbon emissions responsible for global warming. The summit was organized by Gov. Jerry Brown, who has been known to fly private. 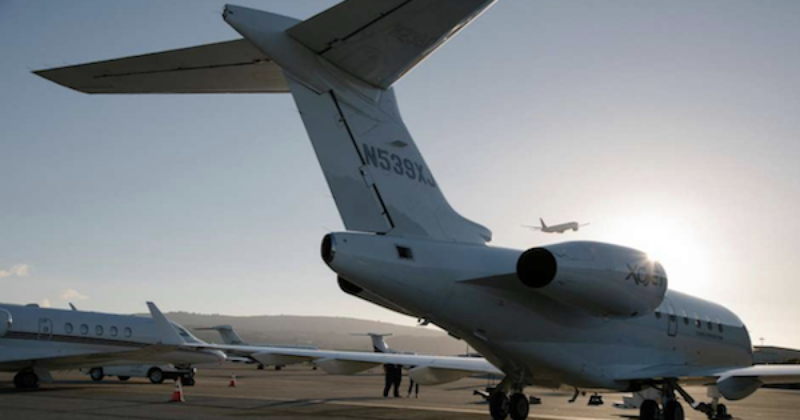 The San Francisco Chronicle reports that private jet traffic was up significantly at San Francisco’s airports last week, largely because of environmentalist bigwigs jetting into town to meet about how to discuss curbing carbon emissions. Airport officials claim traffic was up 30% on the private runways at San Francisco International Airport, and that corporate jets “filled the landing area’s parking slots” and choked up air traffic. Even shrill alarmist Al Gore flew in on a private jet. In fact, his one jet flight is responsible for as much carbon dioxide put into the air as an average American household creates in two full weeks! One other thing from the event also showed the left’s hypocrisy. The conference supplied a green-friendly electric shuttle for the attendees to use to get around San Francisco as they went out to eat and attended fancy parties. But, few used it preferring instead to use their hired limos, town cars, and SUVs.